I wanted to make two pies but only had enough shortening for one double crust pastry. Planning fail. 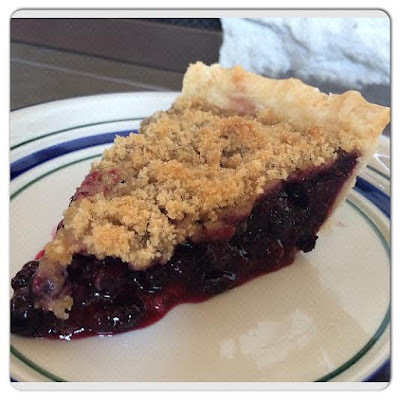 However, this pie is a perfect candidate for a streusel topping. Mind you, what pie isn't a candidate for streusel topping?! This pie is just so summery! Pair it with some vanilla ice-cream or throw it in a bowl with a splash of heavy cream and I'm immediately brought right back to my childhood. Enjoy! Bring water and sugar to a boil in a large pot. Stir in berries and lemon juice. Return to a boil, and allow to simmer for about 10 minutes, stirring occasionally. Spoon 1/4 cup of hot liquid into a small bowl. Whisk in the cornstarch to make a smooth liquid and then return to the berry mixture. Continue to stir over medium heat for about 2 minutes, until thickened. Pour the filling into prepared pastry. Sprinkle with streusel topping and bake in a preheated 350F oven for approximately one hour, or until filling is bubbly and pastry is golden brown. Mix flour and salt together. Cut in the shortening with a pastry blender until it forms very coarse crumbs. Add the cold water, 1 tbsp at a time, until the pastry just holds together. Split into two portions and shape into a small disk. Cover each with plastic wrap and refrigerate for at least 2 hours. 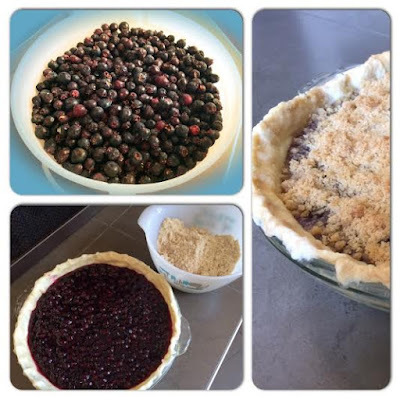 This makes pastry for one double crust pie, or two pies with streusel topping. Mix together the flour and sugar. Cut in the cold margarine or butter with a pastry blender until it forms coarse crumbs.